Synopsis: Twenty years have passed since the tiny kingdom of the Icemark last defended itself from invasion. Now the imperial invader Scipio Bellorum is back - joined by his brutal twin sons The Icemark's fate rests with Queen Thirrin, Oskan Witchfather - and their five strong-willed children. But not all the royal siblings are ready for the task. What of Medea, the dark daughter, poisoning the family from within? Or Sharley, the youngest and weakest son, strangely foretold to return with a blade of fire? Blade of Fire is the second of one of my favourite high fantasy trilogies. At 640 pages, there’s no denying that this is one brick of a book. But the length is irrelevant, because every page is wonderful, whether it produces a chuckle or carries you away into battle alongside the delightful characters. The Cry of the Icemark would always be a hard story to follow up. It has everything a good fantasy needs- great characterisation, epic battles and sweeping descriptions of beautiful landscapes that are reminiscent of the Lord of the Rings films. But Blade of Fire manages to trump all of this. It is the sequel that The Cry of the Icemark deserves. Twenty years on, Thirrin and Oskan have had five offspring. Cressida, the Crown Princess; Eodred and Cerdic, two 16 year old twins; Medea, who has inherited her father’s gift; and Charlemagne, the youngest with a gammy leg. It would always be hard to replace Thirrin and Oskan, and at the beginning, warming to Charlemagne (our new hero) isn’t easy. But as the book progresses, the bond between the reader and the characters grow, and you come to love Charlemagne in much the same way as Thirrin. Thirrin and Oskan aren’t left behind though, and they make many appearances throughout, and although Charlemagne is the main character, the rest of the characters make such large appearances it feels more like there are 10 main characters. Stuart Hill has managed to make Blade of Fire even more epic than Cry of the Icemark. The final battle is on a huge scale, and once again Hill is a master at writing these. The plot is more complicated than in Cry of the Icemark, but it’s still easy to follow, at no cost to the writing. The more simple plot allows us to concentrate of the characters- which really are the heart of the book. Expanding the world of the Icemark, Stuart Hill still borrows cultures from earth. This only manages to make Blade of Fire more realistic and somehow relevant to us, and to be perfectly honest, had Hill introduced more, fantastical races, Blade of Fire would have lost the certain solid grounding it had, and much of the spirit would have been lost. The Icemark trilogy isn’t about the world it is set in or the battles that are thought; it is very much a book about the characters, and by using cultures that we are already aware of, our attention is more readily available for us to absorb the dialogue and the characters. 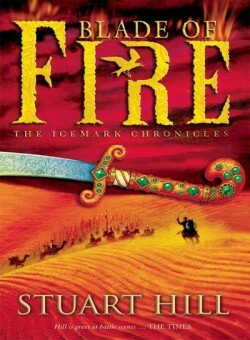 It’s very hard to improve on a book as good as Cry of the Icemark, but Blade of Fire seems to have done it. Characters are explored more than in it’s predecessor, and although many of the characters are older, it does not lose it’s touch, and I have no doubt that this book will be wolfed down by many people, whether they are 11 or 33 or 66, and I’m sure it’ll draw at least one chuckle out of you!